Yellow! 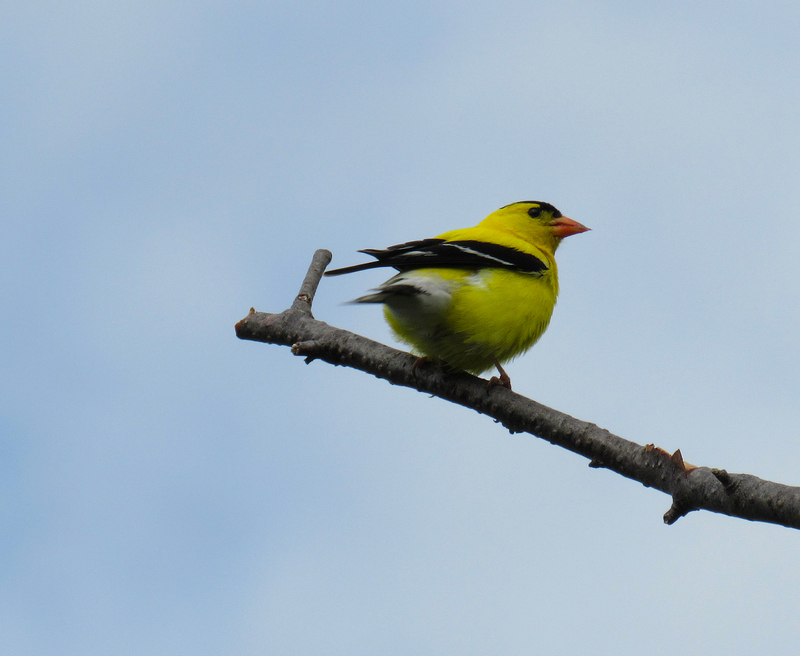 This Tuesday (July 12th) I saw my first american goldfinches in breeding plumage in Calgary. Walking west from the osprey nest in Bowmont Park, on the small dirt path that follows the bank of the Bow River, I saw a bright yellow bird sitting on a low tree branch. I usually see a few yellow warblers in this park, in perpetual motion from one branch to another. But this yellow bird kept the same perch for a while, was a different shade of yellow and was a wee bit bigger. She didn’t fly away when I inched a little closer to sidestep some obstructing branches. 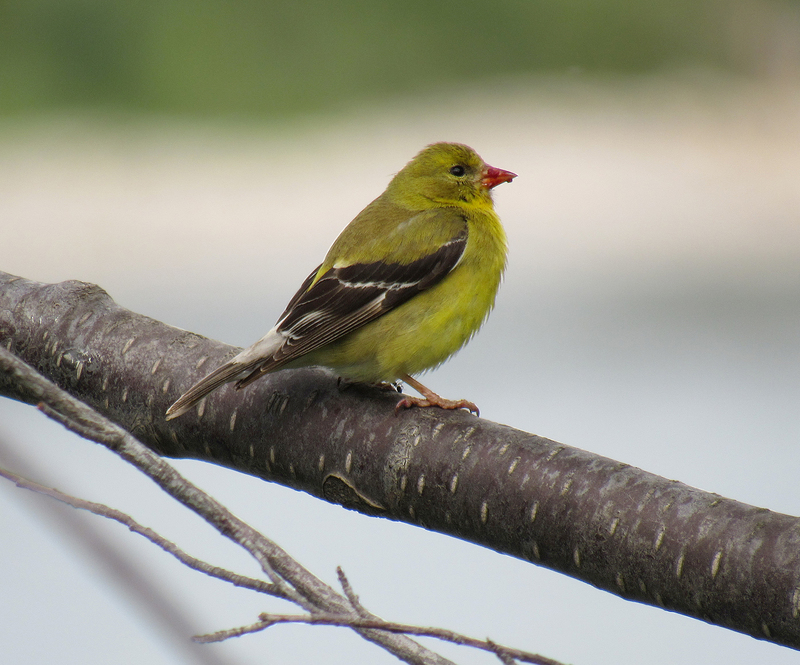 I took a few photos and identified her as a female american goldfinch when I got home – she doesn’t have a black cap and the yellow feathers on her back and head are tinged with grey. She had likely indulged in some juicy red berries earlier since her beak was smeared with bright red mush. I thought she made a brief reappearance later on, but that quick glimpse of yellow turned out to be a male american goldfinch. Her mate maybe? How exciting, and you got beautiful looks of them too! I don’t see brightly coloured birds here very often so it is always exciting to see one and with the added bonus of no branches or leaves in the way! 🙂 Do you get any goldfinches in your garden? My hubby and I got a nyjer seed feeder in the hopes of attracting them to our garden but no luck. They’ve come to the fence a few times, but the House Finches have chased them away unfortunately. I’d love to have them as well as the House Finches. I’ve even moved one feeder further away hoping they could each have separate eating places, but that hasn’t worked either. Great shots, he’s a little beauty! Thanks for your sweet comment, Snehal :-). How lovely that goldfinches used to visit your feeder! Do you know why they stopped coming? Un moment de bonheur a contempler le goldfinche. Tu dois degager un parfum qui attire et relaxe les oiseaux. La canicule se poursuit ,mais un vendredi tout se tolere. Merci pr ttes ces petites miettes de bonheur.J en raffole. Heureux w-e a toi et J ,esperant vs savoir en bonne forme et profiter du w-e. Your photos are gorgeous…and I can imagine how thrilling it must have been to make not just one discovery, but two! I would have danced all the way home after something like this. Brilliant! One of my favorites and a beautiful collection of images Myriam. Thanks for your lovely comment, Laura :-). I’m so glad you’ve enjoyed the presence of these bright birds. I actually thought of your yellow bird of happiness when I spotted the lovely yellow female perched in front of me. BEAUTIFUL! This reminds me of a similarly colored bird someone once gave me as a gift. I set it free the following day. I couldn’t stand seeing it inside the cage. Thanks, Chi :-). Oh my, pet gifts are rarely a good idea! I can totally understand your discomfort with caged birds. I wonder how it fared in the big world. I’m inclined to think it had some difficulties, since it was probably raised in captivity, but maybe it had some good survival instincts which helped it get by. Did you see it again after you let it go? That’s a sweet story :-). Animals have amazing survival instincts. It may have thrived in the forest. Anyway, it was the more beautiful and natural choice.